If you're interested in entering your band in the Thanksgiving Parade of Bands, please request more information and application materials from Tami or Todd Rogers at the contact info above. Join award-winning bands and Presidio Brass in a one-of-a-kind experience as we celebrate Thanksgiving and experience the magic of the Walt Disney World® Resort at the holidays. 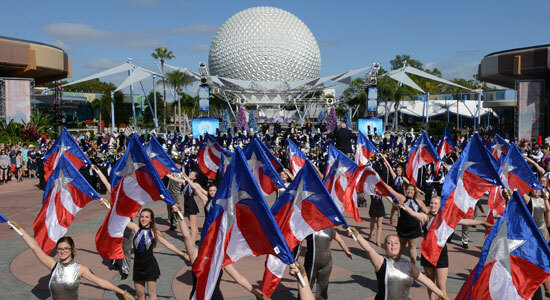 Participating bands work with nationally recognized collegiate and DCI directors, as well as Presidio Brass, to prepare a custom-arranged mass band performance for thousands of park guests at Disney's Epcot, with the option for individual band performances at other on-property venues throughout their visit. Participants enjoy the opportunity to collaborate with other bands and professional musicians in a non-competitive format. A special Thanksgiving dinner and exclusive night-time event at Disney's Animal Kingdom Park (available only to participants) round out this once-in-a-lifetime experience. Learn more and download an application at BobRogersTravel.com/tpob. • Participating bands enjoy time to explore and experience the four theme parks of the Walt Disney World® Resort, in addition to a host of other attractions in the Orlando area. • Spectators who are not traveling with a participating band may experience Thanksgiving Parade of Bands by purchasing regular theme park admission through Disney.